Scrying is the ancient act of divination for the purpose receiving information. The act of scrying is usually achieved by concentrating on, or staring at an object containing a shiny surface until a vision is reached. The information may come through in the form of images, symbols or scenes. Scrying has been practiced throughout the ages and is actively used by many cultures and belief systems and is not limited to one tradition or ideology. 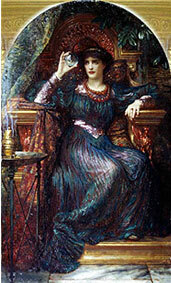 Scrying comes from the English word "descry" which means "to make out dimly" or "to reveal." There have been and are many purposes for the activity; to see into the future, to find lost objects or persons, and track criminals, among others. In the Middle Ages a wise woman or a wise man, perhaps also called a witch, with a natural gift of second sight was called upon for scrying purposes. Scrying is most commonly done with a crystal ball, any smooth surface, such as a bowl of liquid, a pond, a crystal, or, as expert scryers can, a thumbnail. Innumerable objects have been used for the practice over the centuries. The Egyptians used ink, blood and other dark liquids. The Romans used shiny objects and stones. Mirrors are often used as well. One of the most famous people to use this technique was the French visionary Nostradamus, whose images were seen in a mirror and were the inspiration for his prophetic verses. Ancient Persia -- the Shahnama, a semi-historical epic work written in the late 10th century, gives a description of what was called the Cup of Jamshid, used in pre-Islamic Persia, which was used by wizards and practitioners of the esoteric sciences for observing all the seven layers of the universe. Ancient Egypt used scrying in their Initiations. This included water scrying, dream scrying, oil scrying, and mirror scrying. Mormon prophet Joseph Smith contacted angels using two stones called the Urim and Thummim, in his 1829 translation of the Book of Mormon from the Golden Plates. Alchemists John Dee and his partner Edward Kelley employed a form of scrying by using a small crystal ball and a black obsidian mirror. The crystal ball, obsidian mirror, and the Sigillum Aemeth (wax tablet) used by Dee and Kelley are on display at the British Museum in London.